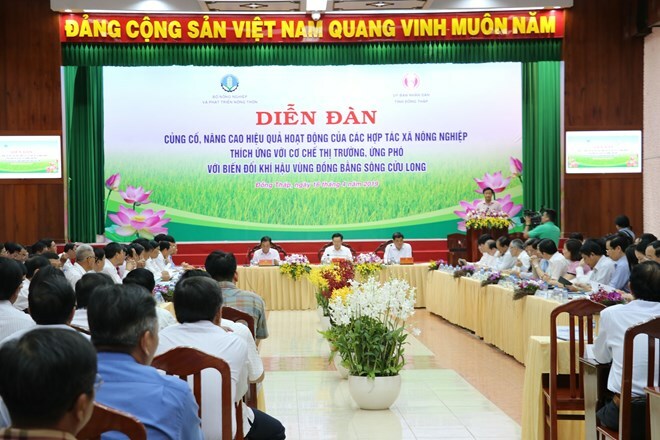 Dong Thap (VNA) – Solutions to help agricultural cooperatives in the Mekong Delta adapt to the market mechanism and climate change were discussed at a forum held in the Mekong Delta province of Dong Thap on April 16. Addressing the event, Deputy Prime Minister Vuong Dinh Hue said the Government has always paid attention to the collective and cooperative economic sectors. He affirmed that agricultural cooperatives have made important contributions to socio-economic development and poverty reduction in the Mekong Delta. While acknowledging the development of cooperatives in the region, the Deputy PM noted that they face numerous challenges at present, such as shortages of human resources and infrastructure. Many cooperatives only focus on reducing production costs without paying due attention to increasing the value of farm produce. To help local cooperatives enhance their efficiency, Deputy PM Hue instructed the Ministry of Agriculture and Rural (MARD) to make the project on agricultural cooperative development an important item in the agenda of the Government’s Resolution 120/NQ-CP on sustainable development of the Mekong Delta in adaptation to climate change. The Ministry of Planning and Investment was told to research and submit to the Government a project on infrastructure development support for cooperatives, while relevant ministries, agencies and localities were requested to increase support for agricultural cooperatives. The Deputy PM also asked cities and provinces to multiply advanced and effective models of agricultural cooperatives. It was reported at the forum that there are 1,803 agricultural cooperatives in the Mekong Delta, accounting for 13 percent of the total nationwide. Secretary of the Party Committee of Dong Thap province Le Minh Hoan shared the view that cooperatives should become the mainstay of small-scale household production and play the role as the link between farmers and firms.